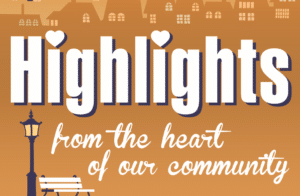 The show airing January 22, 2018 – January 29, 2018 ‘highlights’ the Fund for the Arts and their upcoming Beatles Marathon event & Carnaval Unplugged, a fundraiser for the Clay Center and Charleston Ballet. 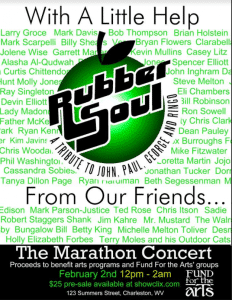 We interviewed Mark Scarpelli, with the band Rubber Soul, a tribute band to The Beatles. Mark is organizing a fundraising event for Fund for the Arts. A very special tribute to the Beatles. A marathon of all 206 Beatles songs released in the United States. The event is unfolding on Friday, February 2nd from noon – approximately 1:00 a.m Saturday February 3rd. The marathon concert will be held at the WV State University Capitol Theatre. Tickets are availabe at www.ShowClix.com. Thanks to sponsors: Bailey, Javins, & Carter, LLC, Law Office of Stephen P. New, and Frost, Brown, Todd, LLC. We also talked with Harry Mills of the Charleston Ballet. He gave us all the information we needed on the fundraising event, Carnaval Unplugged. The Annual benefit gala supports Clay Center and Charleston Ballet. At this legendary fundraiser, you will dine on delightful bites, whirl around multiple dance floors, bid on fabulous auction items and be wowed around every corner. Anticipate the unexpected! 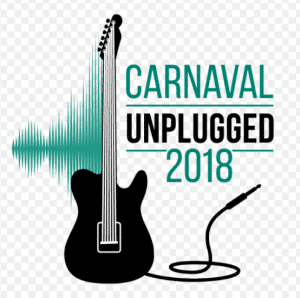 Carnaval Unplugged celebrates the synergy of sound waves known as … music. Explore innovation, classic artists and the musical moments that shape generations. Jam out to the latest hits, relive the soundtrack of your life and explore new genres. Call 304-561-3570 or 304-342-6541 for ticket information.